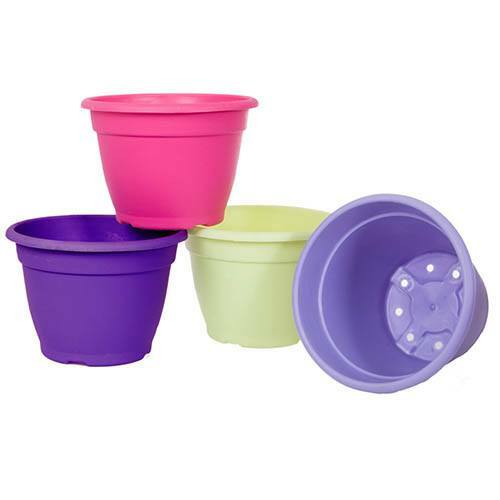 Bold and bright durable plastic garden pots. Collection includes one of each colour. Perfect for bedding plants, perennials and more. Each pot holds 6.5L of compost. If you want to create a WOW in your garden, these lovely bold and bright plastic planters are just the ticket to set off sizzling seasonal summer bedding displays on the patio or decking. A mix of 4 zingy starburst colours (Opal Fruits if you are a certain age! ), you get one each of the 4 colours shown. Perfect for spring bulbs, bedding, small shrubs and flowers, there's plenty of choice! Bold coloured plastic planters, long lasting and both UV and frost stable, re-usable for many years. One of each colour; Lavender, Celery, Pink and Orange.